Megan’s just lost all her hair overnight!……. Well, not really but I wanted a headline to launch into this exciting episode and that’s the best I could come up with (actually, I was going for ‘Megan’s been shot!’ but apparently that’s ‘not in good taste’). In reality it’s all very calm and quiet within team Trek to Oz and the stress levels are starting to come back down after all the Land Rover dramas. I think I told you last time we spoke that the car was in the container awaiting a ship. Well the ship sailed on the 18th (with our container one hopes) and should be with us in 2 weeks. Our last few days in Dubai were spent relaxing on the beach, window shopping in the malls and catching up with a long lost school friend (Lloyd) who I had not seen for 13 years. He hadn’t changed a bit; where the hell was his grey hair?!? Two days before our departure our lovely hosts, in a final act of kindness, paid for us to go up the Burj Khalifa, currently the world’s tallest building. We went up after sunset to see the city at night and it was quite an amazing view. The lift takes you up 130 odd floors in less than 30 seconds and deposits you on the viewing platform. 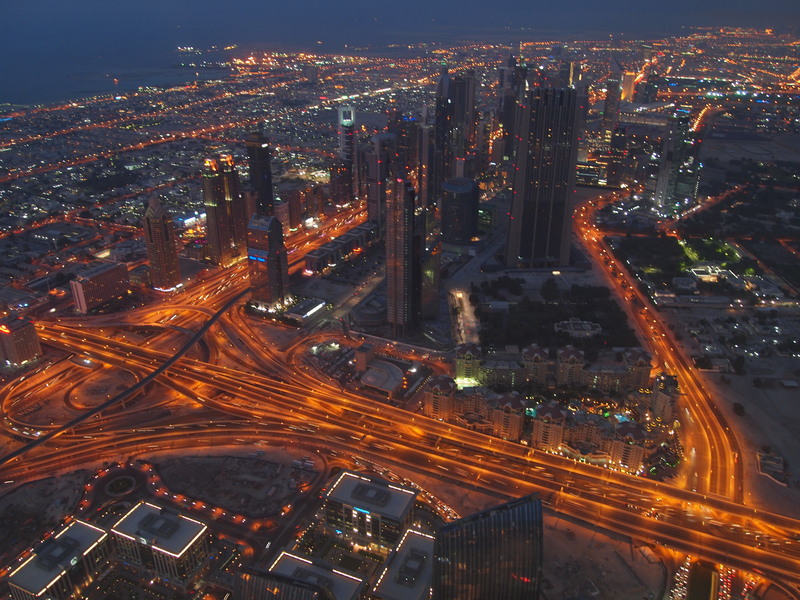 It is quite incredible to see such a vast city surrounded by nothing but desert. On the 16th we said our goodbyes to Ann, Mike and Ann’s sister, Jane and her daughters, who were also staying at Hotel Platt, and jumped on a plane to Kuala Lumpur. We both enjoyed Dubai and the UAE immensely. We were surprised by the size of the place and fascinated with the history behind it all and the speed with which it has developed. I’d never really thought of Dubai as a holiday destination, but if you are into celeb spotting (we saw some bird from Eastenders), posh cars and lovely beaches it is definitely worth a visit. Once again, we can’t thank Ann and Mike enough for their hospitality. THANKS! 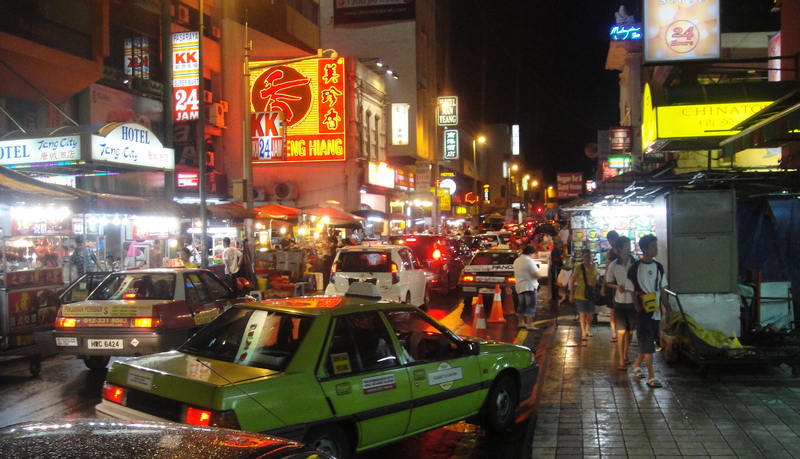 So onto SE Asia… it’s hot, damn hot. We arrived at 6am on the 17th and caught a taxi to our hotel but unfortunately we couldn’t check in till midday. Never mind we thought, let’s go and see the national museum and kill some time whilst ticking a few things off the to do list. However when we arrived we discovered it was closed because of the public holiday for Eid, along with all the other tourist sights in the city, doh. So we went to the nearest air-conditioned shopping mall and spent five hours studying the Lonely Planet and drinking far too much coffee. I must have a little gripe at this juncture: there seems to be a craze sweeping the parents of Malaysia at the moment, where by they buy their children shoes with squeakers in the soles. Oh my god is it annoying! I’d go so far to say it is the most annoying thing in the world right now, far more annoying than Megan’s snoring, the total lack of Cheerios and a Land Rover that spontaneously combusts. Maybe it was the jet lag, five coffees or the heat but I had an over whelming urge to punch the offending children in the face. The fact I’m able to type this blog means that I didn’t, but it was a close run thing when a family of four squeaked on by. We have spent the last few days exploring the Malaysian capital and doing the Lonely Planet guided walks, the highlight being the Islamic Museum of Art which, if I’m honest I thought was going to be a snooze fest but in fact was very interesting and housed in an amazing building. We have eaten for less than £4 on most nights and our hotel was only £20 a night so the daily spend graph is coming down, which is very exciting I’m sure you will agree. I have joined the Malaysian Land Rover Club, http://www.lrom.com, (yes, I really am that sad) and some very friendly people have got in touch with us, giving us ideas on where to explore once the car arrives and good garages to use. They really are a friendly group of people; offers of free accommodation have also been made which is great- can you imagine that kind of thing happening in the UK?…not a chance. We are now on the Island of Langkawi, where we shall await an email informing us that Harriet the Land Rover has arrived in Port Klang. Let’s hope it comes soon, as I miss her and Megan just doesn’t have the same looks to keep me interested like she does! 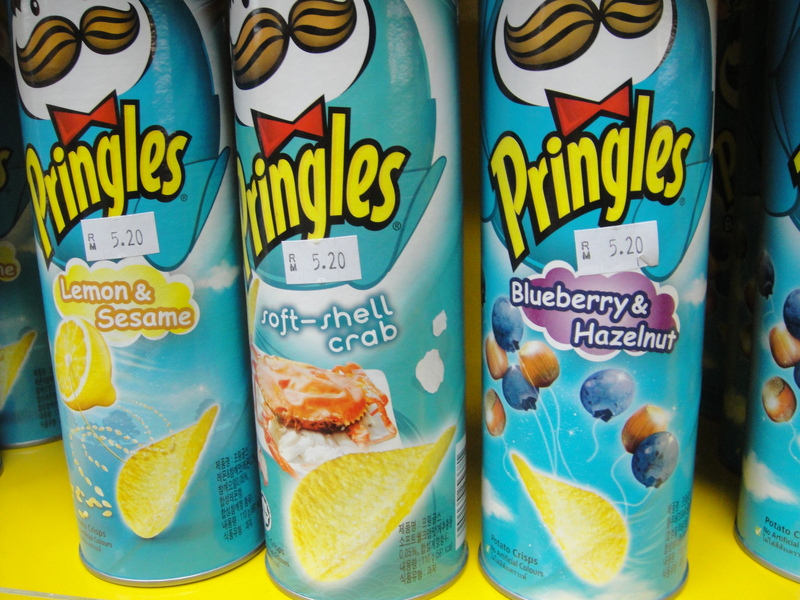 Soft-Shell Crab Pringles …. lovely!!!! If you want a real treat, whilst there try the local fruit. Two immedaitely spring to mind – durian fruit, the most disgusting smelly, slimy fruit imagineable, although surprisingly it tastes okay. Banned in many hotels, bars, shops, etc. it really must be experienced … one of those ‘must do’ things. Best bought at a roadside stall, it’s only a ringgit or two. After that delight, the one to go for is rambutan. Much like a lychee, it is heaven after durian (most things would be). Again, cheap and plentiful, they can be purchased anywhere in Malaysia. Whilst talking about food (I’m geting hungry!!!) you gotta try Tom Yum soup. Okay, it may have originated in Thailand, it’s found all over SE Asia; great if you like spicy soup full of seafood and veg, it’s a meal in itself! Now that really is mmmmmmm!!!! Really pleased you managed to get the Landy working again, enjoying your tales and looking forward to each installment. Enjoy the food but stay close to the bathroom!